His ambition now is to be a fitness model and be in his national Paralympic sledge hockey team. How do individuals such as Kutovoy achieve such a remarkable level of reintegration? This study investigated the potential for counselling in that process. 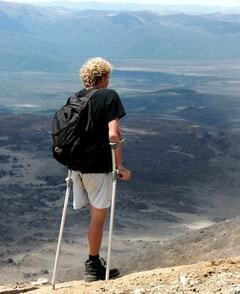 Two or three people, mostly younger males, are paralysed each day in the UK (Spinal Research, 2011). The figures for traumatic amputations are hard to obtain, but are likely to be similar (BBC, 2016). – A sense of loss akin to bereavement (Njoki, Frantz and Mpofu (2007), altered body image (MacKenna, 2007), coping with being an object of curiosity and becoming public property (Thomson, 2009), accepting a new self (Deegan, 1978; Murray, 2009), and a sense that there is pressure to adapt ways of managing social interaction to ease discomfort (Thompson, 1997). – Changed dynamics within relationships, parent-child, between spouses or partners, between friends. For example, parents’ unlimited care does represent a major problem to young people because the increased drive for separation that is specific to this phase is frustrated. Parents find it difficult to overlook the handicap and to permit the young person to develop independence (Seiffge-Krenke, 1995; Gill 1999). Traumatic disability breaks open the protective shell of physical boundaries; the private world is violated, positive assumptions about the future shattered. In seeking to restore that integrity Livneh, Antonak and Gerhardt (2000) argue that a cardinal role is played by the individual’s coping strategies and further, that ‘resilience’ should not necessarily be interpreted as ‘denial’. Stuart Butchart was 28 when he was shot by bandits in an ambush in Guatemala and paralysed. He observed in an interview given to the BBC (2017) that, “To some degree, the way you respond to something extraordinary like a spinal injury or living life in a wheelchair is actually the way you respond to anything in life which might happen, the washing machine breaking down or the car not working”. Factors which could contribute to the constellation of adopted coping strategies include the cause of disability (was the individual doing something he enjoyed such as skiing? ); age and social support (Livneh et al, 2000); spirituality (Matheis, Tulsky and Matheis, 2006); and participation in sports, particularly team sports (Kijanskiy, 2007). Albrecht and Devlieger (1999) suggested that the onset of disability might be a resource that stimulates value clarification and goal orientation, an impetus for psychological and spiritual growth, sometimes a rediscovery of religious faith. These individuals use their disability to reinterpret their lives and reconstitute personal meaning. However, that approach is criticised by Koch (2000) who argues that physical difference is not necessarily determinative of life quality, an assumption described by Campbell and Stramondo (2017) as an ‘ableist fantasy’. Implicit in the phrase ‘overcoming adversity’ is the idea that success, or happiness, is about emerging on the other side of a challenging experience unscathed or unmarked by the experience… But, in fact, we are changed. We are marked by a challenge, whether physically, emotionally or both. And I’m going to suggest that this is a good thing. Adversity isn’t an obstacle that we need to get around in order to resume living our life. It’s part of our life. A study by McKenzie (1992) showed that whilst many patients were satisfied with the medical care they had received for their physical condition, only 10% of over 500 people interviewed had received counselling as part of their rehabilitation. This discrepancy was well illustrated by the orthopaedic registrar who attended Oliver Sacks (1984) after a climbing accident: ‘We orthopods are really carpenters, in a way. We are called in to do a job. We do it. And that’s that. The subjective [is] not the sort of thing we can be concerned with’. That lack of counselling was particularly felt when patients left hospital: ‘it was often only then that the majority had the opportunity and ability to face up to the emotional impact of their new situation, and many people described themselves as feeling extremely isolated’. Nearly all the people interviewed felt they could have ‘benefited greatly’ from counselling, support and emotional aftercare (McKenzie, 1992; Dickson, Allan and O’Carroll, 2008). For some, however, recourse to psychological therapies carries a stigma, an implication of failure, or a threat to their independence: ‘for people who have to use physical crutches, the addition of psychological crutches is a distressing experience to be avoided unless absolutely necessary’ (Schoenberg and Shiloh, 2002). Oliver (1995) argues that becoming disabled is a discontinuity in a person’s life, a transition, moving from total preoccupation with the disability through to its integration into his/her life, and that it is the individual’s perception of that change which has the greatest implications for counselling. The focus should be, ‘one of very consciously giving control back to the client or enabling the client to empower themselves’. The techniques are those of counselling an able-bodied client, notably providing what the client needs. Parallels can be drawn between the newly disabled person and the gay adolescent. Radkowsky and Siegel (1997) stress that the ultimate goal of adolescence is the emergence of a secure identity, a positive sense of self. I would suggest we substitute ‘rehabilitation’ for ‘adolescence’. Moreover, Samuels (2003), for example, argues that both groups are linked by a desire for self-actualisation, ‘coming out’. They are both departures from the hegemonic norms, the default settings, of heterosexuality and of full physical capacity. In each case the individual has to (re)construct his internal, subjective, world to accommodate objective externalities (Kelly, 1963). In my research into acquired disability the participants were nine adults in their 20s, 30s and 40s who had either lost a limb or limbs or who had suffered spinal cord injury, the injury having been sustained between one and twenty years previously. This study was approved by the Research Ethics Committee of the University of Greenwich (Gladwell, 2015). All names of participants are pseudonyms. At first sight, the fact that only four of the participants had received counselling was disappointing. However, that eight people, including those who had to be excluded, came forward knowing that they did not meet the advertised criteria is of itself highly significant. It suggested a need, even amongst those who rejected the idea of formal ‘help’, to tell their story. It is also consistent with the relative lack of availability of rehabilitation counselling. A participant whose amputation was carried out at a major London trauma centre, for example, was not offered counselling. This in turn reflects the precedence generally given in rehabilitation to mechanical, over psychological, issues (Rybarczyk et al, 1995). In two instances the counsellor, in both cases associated with a rehabilitation centre, came in for high praise; and a group session in which, “No one told you anything but you could take away from it what you wanted to”, was also of benefit. But protocol-driven CBT was unhelpful; it was either inappropriate for the particular client, or half-heartedly administered, and one counsellor was seemingly deficient in empathy, or at least unaware of the emotional challenges occasioned by sudden disability. The central question, therefore, is who might benefit from counselling? Not everyone needs counselling to come to terms with their loss (Reeve, 2000). George felt he didn’t need it because he had the support of his close colleagues and the benefit of being in a military community, a forces’ rehabilitation centre, focussed on return to active service; and for Ivan it would have been “a cop out”. And Ivan asked: ‘Talk what through? I’ve lost my leg, you can’t put it back on. It’s down purely and utterly to me.’ For Ethan, on the other hand, amputation came as welcome relief from excruciating pain, an opportunity to restart his life. Those factors must be respected. But when might, ‘It’s down purely and utterly to me’ camouflage a deeper distress? Becoming disabled is a profoundly isolating, profoundly intimate experience. The individual falls into a parallel world, a world previously unknown to him, and a world unknown to those around him. Leaving hospital, in a wheelchair, on crutches, with an empty sleeve, the individual is propelled, as if naked, into an uncomprehending and sometimes unsympathetic world, cast adrift from his previous experience and from the experience of family and friends. Ethan was angered by a nurse sitting on his bed where his leg should have been: “I would absolutely freak out. My mind is saying, you can’t be sitting there, my leg should be… My hairs stand, I can’t talk.” And George was angered by people who said: “‘I imagine how you feel’. Well actually you can’t. Unless you’ve been through the same thing your imagination can’t take you there!” These are feelings difficult to express, difficult for the person himself to understand. Add to that that participants were reluctant, or unable, to discuss their emotional concerns with partners or parents, either for fear of upsetting them or because they themselves are intimately affected by the situation, possibly in ways they might not wish to share with the disabled person, and the emotional ground too complex. The traditional male role model itself has differing implications for rehabilitation. Emotional control, determination, and drive for success are associated with positive rehabilitation, whereas a man’s striving for dominance makes it particularly difficult for him to adapt to a more vulnerable role; and the traditional value placed by men on autonomy works against the collaborative rehabilitation process. Accordingly therapeutic interventions should focus on helping the individual to find the place at which his disability shapes, but does not contradict, his masculinity (Clare, 2001, 2003). But first, they have to enter the counselling room. It is necessary to obtain some traction with the potential client as some who are the most resistant might in fact benefit most. Avoiding Oliver’s (1995) ‘coercive’ approach, this might be addressed by bringing counsellors more closely into the rehabilitation process, introducing them as part of the team, so that their presence is as normal as that of the physiotherapist or occupational therapist. Ultimately, however, the decision must be the individual’s own. Four further and important issues arose. First, a concern that a disabled client might be more comfortable talking to a disabled counsellor. This was not apparent. Indeed for George, being able to ‘teach’ the author about his situation felt empowering. It might be that in the initial encounter a disabled client might feel more at ease with another person with a disability, but if the other elements of the relationship are in place any awkwardness should soon dissipate. Secondly, a need for the counsellor to have a background understanding of the challenges that might face a newly disabled person, and to have an awareness of society’s pre-conceptions of disability and the risk of his or her importing them into their reflections. Also, to appreciate the individual’s own potentially ambiguous relationship with his disability; Ivan emphatically didn’t want to be categorised as ‘disabled’, but: “Sometimes it does piss me off when family forget that I’m disabled.” It is important for a counsellor to acknowledge that disability as experienced from the ‘inside‘, is very different from how it is imagined from the ‘outside’ (Dunn and Brody, 2008). Unfortunately we have not received any assistance with our situation, counselling, advice, and we have made this “journey” completely alone. I did raise a suggestion to the specialist hospital my husband attends. They were unable to help but suggested I start a self-help group. The final point, raised by Ivan, was counselling for family members. They are, in one sense, bystanders, separated by an unbridgeable void, but their suffering is just as real. Again, this would seem to be a lacuna meriting investigation. The counsellor’s role is to help the individual reach that state of equilibrium, to have a sense of Kutovoy’s ‘clean sheet’, and to grasp that what is written on it is their choice and that there is a possibility of learning from, even benefitting from, the experience. There can be a loosening of the constraints imposed on the individual by society (Hahn, 1993), family or indeed internally. The idea of positive change can be introduced carefully, in the context of a trustful and intimate therapeutic relationship whilst acknowledging that the absence of growth is not to be seen as a failure (Zoellner and Maercker, 2006). It is for the counsellor, as in all counselling, to address the needs of the client, to seek to understand his or her perspective, not to exaggerate their situation, nor to diminish it. ‘I don’t know how you cope’ or, ‘You’re managing very well’ can be undermining. Counsellors must be flexible in their therapeutic approach, not tell the client, as happened to one participant, what they are thinking nor, “trace the ponderous movements of an endlessly proliferating tribe of archetypes” (Edmund White, 2000).